Want to know that an industry-leading cabin looks like according to the standards of today’s finest luxury vehicles? Just get a closer look at the 2018 Land Rover Range Rover Velar interior. This model is set to be equally as accomplished both on the road and in the cabin, and you can rely on Land Rover Princeton for all your Velar info while we wait for it to hit the showroom floor. When you’re ready to sit in the seats, explore the space, and interact with the features visit Land Rover Princeton for a complete tour. Drivers have the option to configure ambient lighting settings inside the cabin. The mood of your Flemington travels is entirely up to you. Everyone in the cabin rides in complete comfort, because everyone is able to set their own preferred temperature preference. Arguments about being too hot or too cold are a thing of the past. If you’d like to enjoy breezy Bridgewater weather, you can open up this expansive sunroof and let the sun and breeze fill up the cabin. Intuitive controls make it quick and easy to open the sunroof without taking your eyes off the road. The front seats are available with both heat and ventilation, and the second-row seats are available with heat. The upscale experience you expect from a model like the Velar is accessible to everyone in the cabin. This cabin is full of smart designs and high-quality materials, but what really makes it feel like a premium automobile is the thoughtful integration of sophisticated technologies. 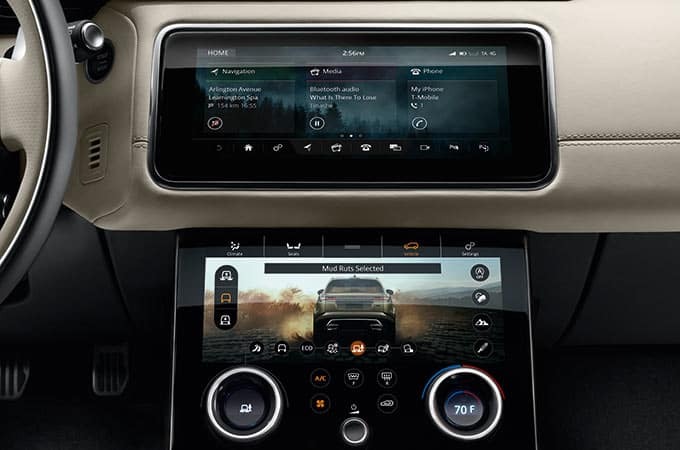 The cabin comes standard with a touchscreen display that handles cabin controls while giving drivers access to extensive options for entertainment, information, and connectivity. The traditional dash can also be replaced with a 12.3-inch screen that offers customization options and a wider range of information. Plus, there are four distinct audio systems available, each capable of filling the interior with rich and clear sound. The cabin of this luxury SUV is just as exceptional as its performance both on and off-road. Land Rover Princeton is the area’s best place to take a test drive and work with a team of Land Rover experts. We also make financing stress-free and have resources to support drivers throughout their ownership. If you have questions about anything, please contact us at your convenience.